Thank you Randi and Austin Lesher for the cool sculpture for the gym! 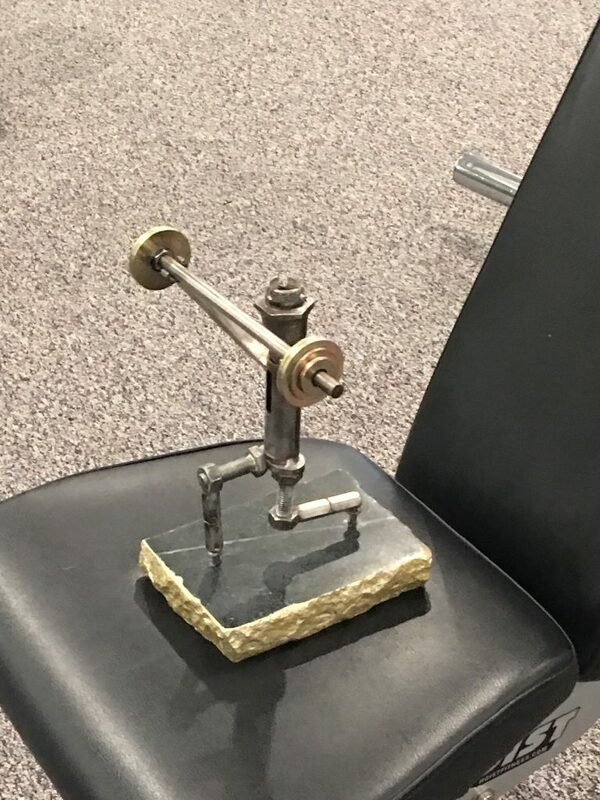 Can’t work out? Or don’t want to work out? My wife Kathy recently had her second carpal tunnel surgery on her right hand. 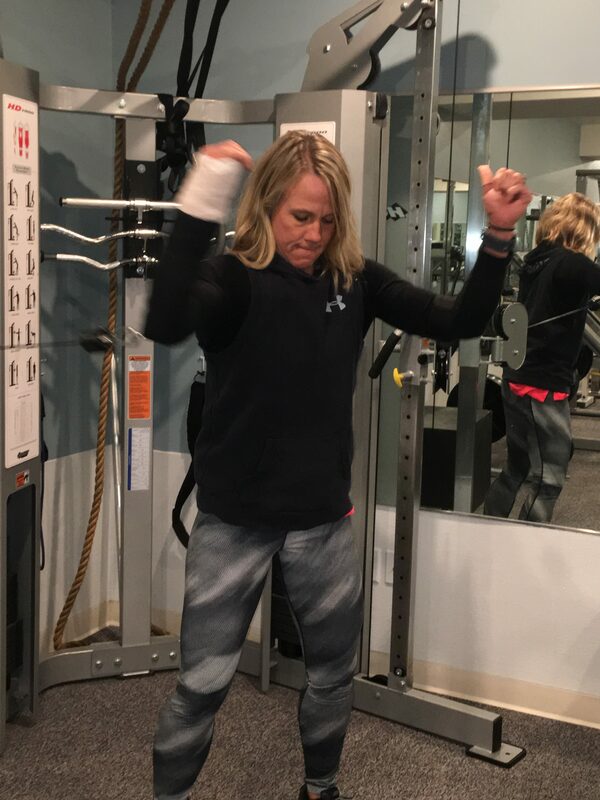 Her doctor told her the only limitations she would have would be how much pain she could tolerate and that she would not be in danger of injuring her wrist if she worked out. Although Kathy is driven to succeed she is also mindful of her long term health and would not go against the doctor’s orders and risk permanent damage. Last week her hand and lower arm were in a splint and she could have easily found excuses not to work out but this is not her nature. 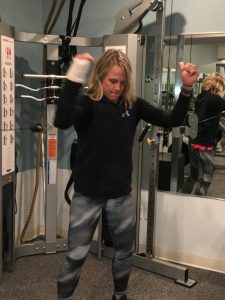 To work around her hand being splinted we devised exercises so she could get an effective chest and shoulder workout without involving her hand and wrist. As they say, “Where there is a will there is a way”. She has not missed a workout since her surgery. Bill Bosnyak is a client of ours. He recently tore his achilles tendon in an accident. It would have been easy for him to find excuses not to work out but like Kathy it is not his nature. Within a few days he was back in the gym working out with us. And only missed two weeks of workout time after his surgery and this was due to significant pain and his inability to drive with the cast on. 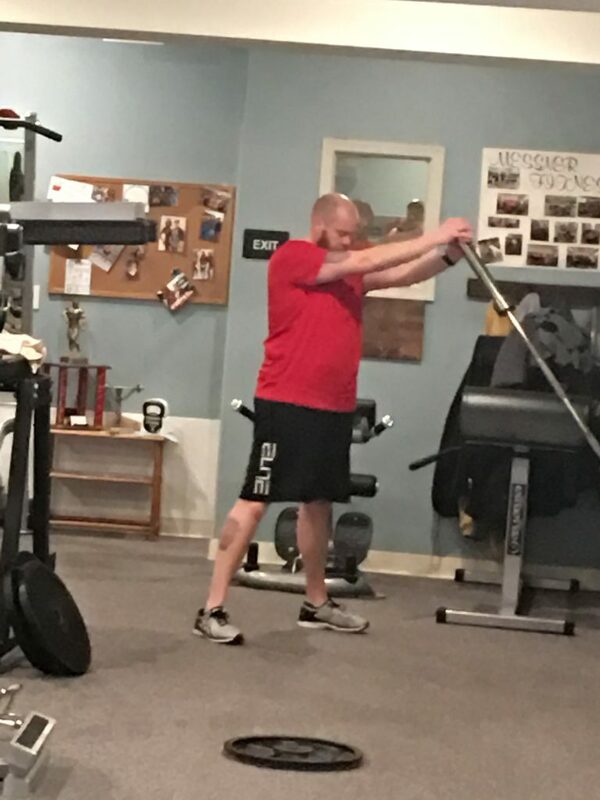 As soon as his cast was replaced with a boot he was back in the gym working out (with doctor’s approval) and even working his legs. 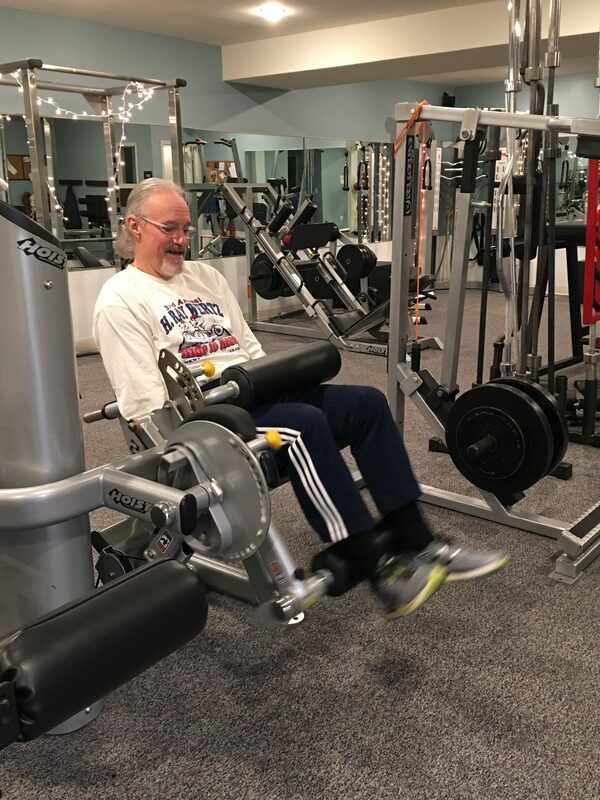 Last week Bill surprised us by walking into the gym without his boot on. This was only five weeks after surgery. His doctor was amazed at his recovery. At 67 years old he is recovering at a rate much faster than people half his age. I use my wife and our client Bill as examples of what can be done when we really want something. It would have been convenient for both of them to make excuses and take extended periods of time off from working out. In both cases they have refused to let adversity bring them down. They don’t make excuses. They make it happen. “I don’t have enough time” has become the mantra for many whose fitness goals never seem to materialize. We live in a world where everyone is in a hurry and no one has enough time to get anything done let alone fit resistance training and cardio into their hectic days. At least that is the excuse often used. I have a simple solution that serves multiple goals and is a real time saver. My wife and I do a twelve and a half to fifteen and half minute HIIT workout 6 days a week. On our strength and muscle building workout days we do this HIIT workout after our workout. Doing these short HIIT we have been able to maintain and gain strength, keep our body fat and weight down and keep ourselves in good cardiovascular shape. As I mentioned earlier we do a HIIT workout 6 days a week for 12 and a half to 15 and a half minutes. We choose 5 exercise and often use intervals of 20 seconds on 10 seconds off and 30 seconds on and 15 seconds off. We do vary these intervals but those are the two we use most often. 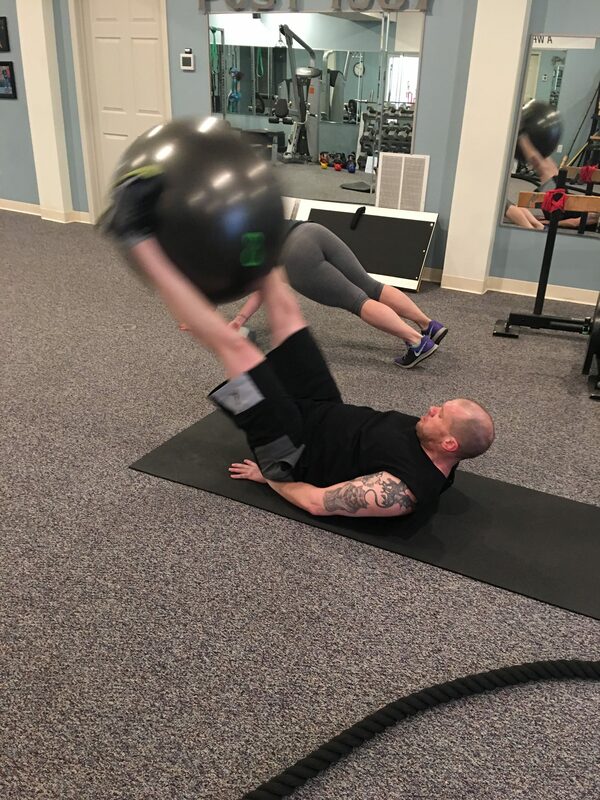 The exercises selection for one of our HIIT workouts may look like this: Battle ropes, medicine ball slams, rowing machine, sled pushes, and high box step ups. Despite having our own gym we often run into time crunches which limit the amount of time we have to work out. This especially happens on Fridays when we work back. If we feel that we don’t quite get the volume of back work in that we like we will add a few back exercises into our HIIT workout. So, if we feel we didn’t do quite enough lower back work and wanted to get another rowing movement in but ran out of time we simply add a lower back and rowing exercise into our HIIT workout. A HIIT workout with added back exercises might look like this: Jump Rope, bent over dumbbell row, Kettlebell squat, band good morning, Leg raise with the stability ball. The combinations are endless. Don’t let a lack of time keep you from your fitness goals. No Adduction Machine? No Problem. My wife and I run a personal training gym. Due to our limited space we must be very selective when choosing equipment. Big, bulky single use machines that take up a lot of space are not an option for us. This precludes us from buying items such as an adduction machine. I won’t go into the pros and cons of such machines but will say that they offer variety when working the legs. 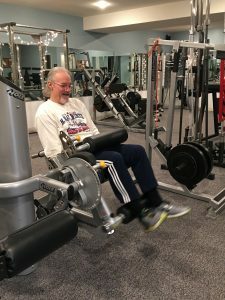 So, what do you do when you would like to work the adductors in a similar manner to an adduction machine but your gym doesn’t have one? This is where a little creativity comes in. 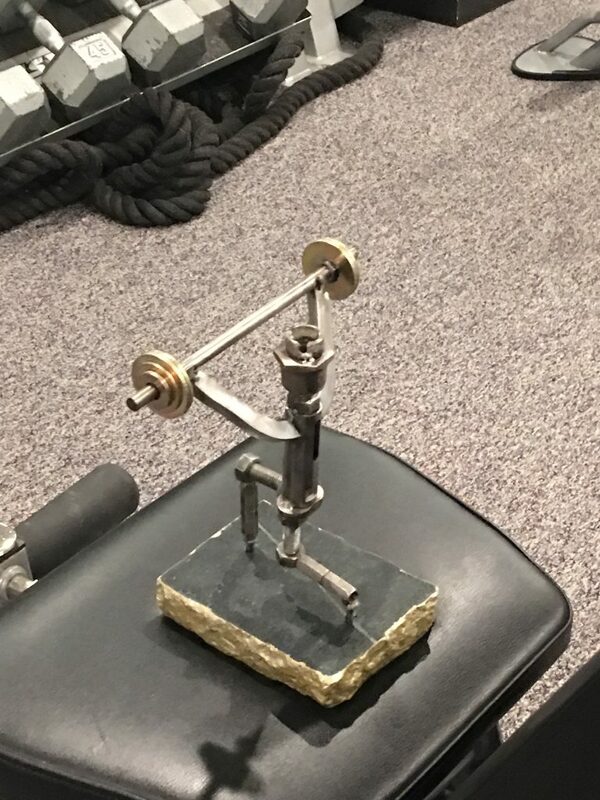 My wife and I have devised several ways to work this muscle group that do not require a single purpose machine. One of our favorites that we have devised for working the adductors involves a band set up in the squat rack (see pictures below). 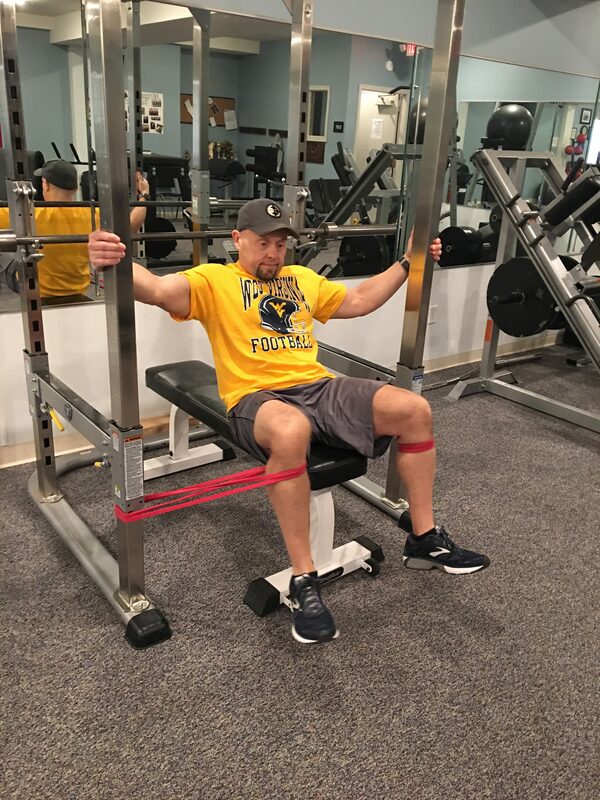 The band is doubled up around the base of the squat rack and the leg goes through the loop. This doubled up band is placed just below the knee. Leaning back slightly we lift the feet off the ground and squeeze the legs together. 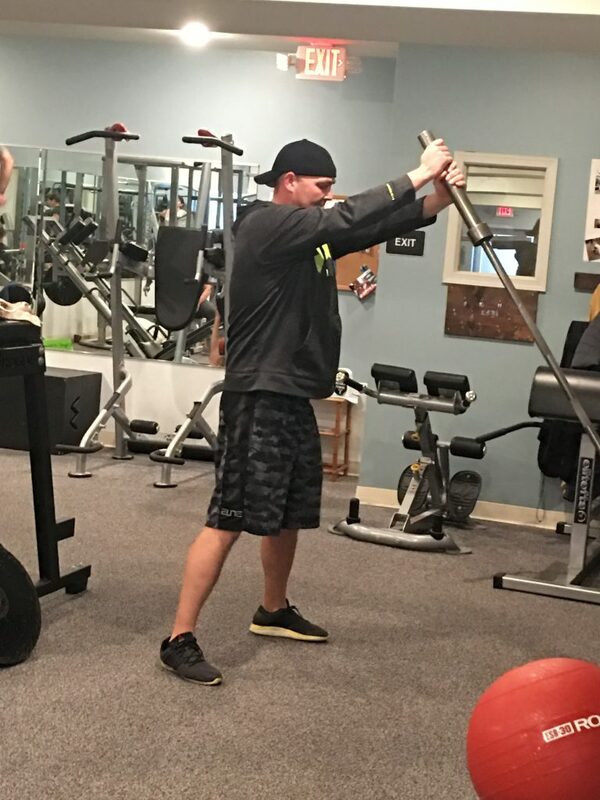 Resistance can be adjusted by sliding forward or backward on the bench. The further forward you go the more resistance and the harder the exercise. Varying degrees of bands can also be used to find the resistance that best suits you. 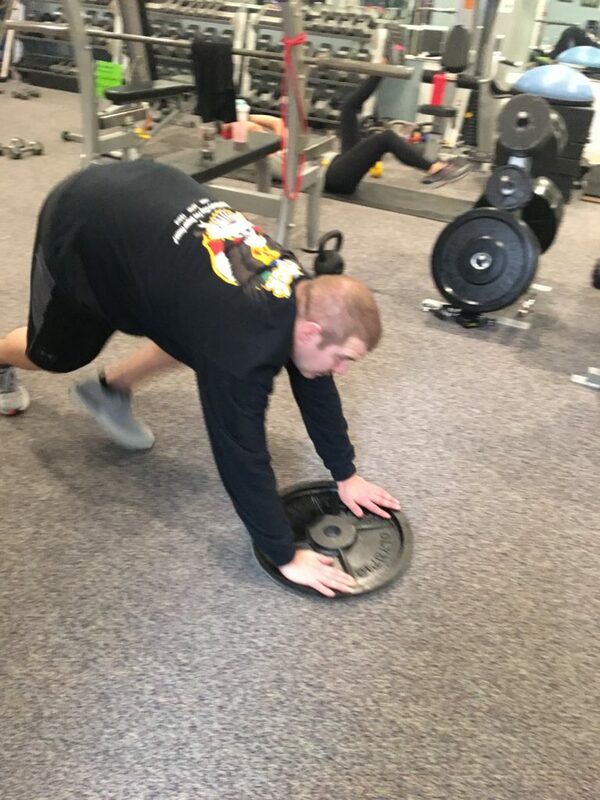 We often do reps in the 10-15 range and at the end of the set do a hold for 20 seconds. Slow eccentric and concentric portions of the lift can also be done to increase the intensity. The variations are endless. 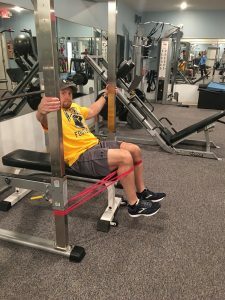 If you have a squat rack give this exercise a try. I guarantee your adductors will be thoroughly worked. Join us this Saturday at 10 AM for Yoga! 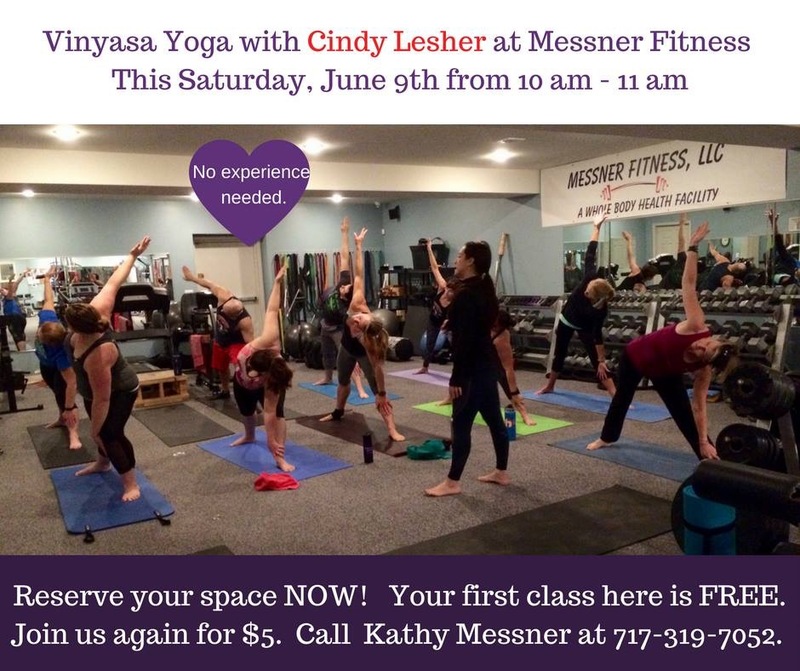 Join me this Saturday for Vinyasa Yoga at Messner Fitness LLC with our hosts Steven Messner and Kathy Messner. I teach to all levels. Sign up now to reserve your space. 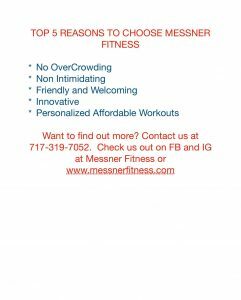 Just $5 or your first class with me is FREE. Check us out! We are result driven. 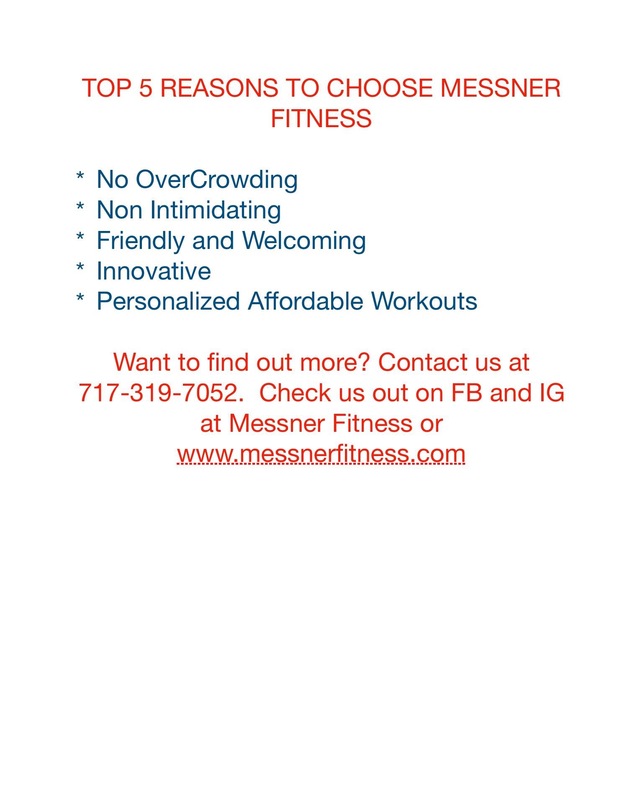 No matter what your goals are or fitness level we can help! Get fat burning cardio and abdominal work done in 15 minutes or less! Anyone that trains in our personal training gym knows that we are big on HIIT or high intensity interval training for cardio and fat burning but there is another reason we like this method of training. 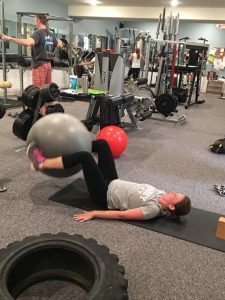 We like this method because we also work our abdominals during a HIIT session, effectively killing two birds with one stone. Using this methodology the old argument of “I don’t have time to do fat burning cardio and abdominal work” loses its relevancy. 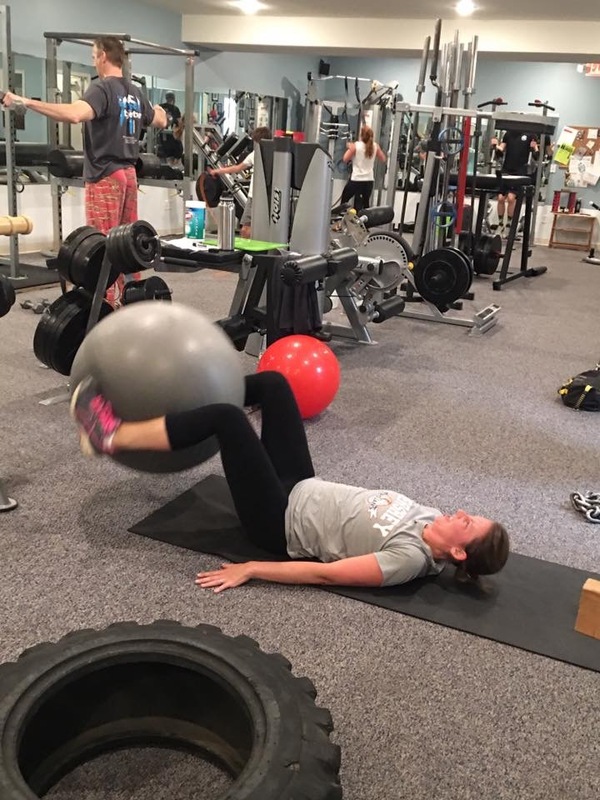 We do offer two hour long HIIT sessions a week in which we program in multiple abdominal exercises. For our shorter HIIT workouts we usually do 1 or 2 abdominal exercises. 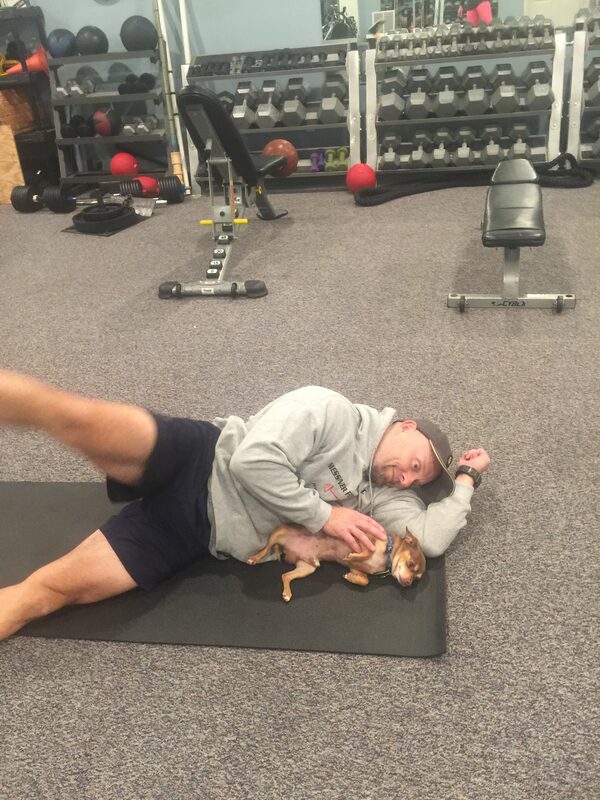 My wife and I do the short HIIT workouts every day and therefore do 1 abdominal exercise in those workouts. We then work out abs 6 days a week but with a low enough volume that we recover for the next day. Our after weight training HIIT workout would contain 5 exercises and our intervals would be 30 seconds on and 15 seconds off for a total of 15 minutes and total of 4 rounds. On another day we might do 5 exercises for 20 seconds on and 10 seconds off for a total of 12 minutes and 5 rounds. The possibilities are endless. A list of the exercises we might do in a fifteen minute HIIT session might be tire flips, Kettlebell swings, rowing on the rower, medicine ball slams and a leg raise with the stability ball. Again the possibilities are endless. On a final note we always chose safe exercises for our HIIT sessions. Everything is controlled and we don’t use heavy loads. We save the heavy lifting for our weight training sessions.